DC Office Chirang Recruitment for Data Entry Operators: Last Date 31-07-2017. - Jobs4NE : Jobs in Assam and North East India. 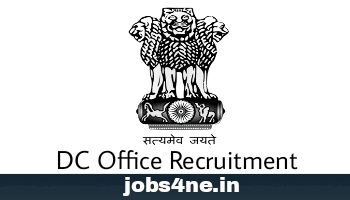 DC Office Chirang Recruitment for Data Entry Operators: Last Date 31-07-2017. In pursuance of the Govt. letter No.ELE.97/2013/Pt/95 dtd 6.6.2017, applications are invited in Standard Form as published in Assam Gazette in Part IX from the citizen of India as defined in Articles 5 & 8 of the constitution of India for filling up of the following sanctioned posts of Data Entry Operators at Election Branch of Deputy Commissioner’s office, Chirang, under Rule as shown below. Last Date for receipting of Application: 31-07-2017. Name of the Post: Data Entry Operators. No. of Posts: 2 Nos. Scale of pay: Rs. 5,200- 20,200/- + GP Rs. 2,400/- PM + Other admissible allowances. Age Limit: The candidates must not be less than 18 years of age and more than 38 years of age on 1.1.2017 and upper age limit is relaxable by 5 years in the case of SC/ ST candidate as laid down by Government from time to time. Educational Qualification: Graduate in any dream with minimum 60% marks in aggregate with an UGC/ AICTE approved / recognized Diploma in Computer Science / Applications / O level or equivalent certificate from NIELIT or Diploma holders from Polytechnic with minimum 60% marks in aggregate or equivalent grade from UGC/ AICTE approved / recognized Institution in Computer Science / Computer Engineering / Electronics/ Telecommunication Engineering / Information Technology. How to Apply: Completed application forms along with other supporting testimonials, 3 (three) copies of recent passport size photographs duly attested should be submitted during the office hour in the office of the Deputy Commissioner, Chirang, Kajalgaon on or before 31st July, 2017 only in working hours up to 5 pm. For further details may visit Personal Branch of Deputy Commissioner Office, Chirang, Kajalgaon office during office hour and website www.chirang.gov.in.